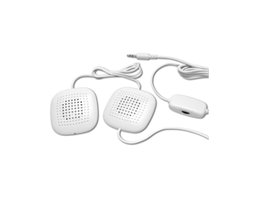 Turn any pillow into a Sleep Therapy Pillow with our ultra-thin stereo speakers-now with inline volume control. 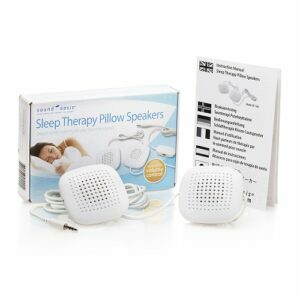 Simply place under your existing pillow and enjoy your favorite music or sounds for optimal relaxation and comfort. Couple your pillow speakers with a sound machine or white noise machine and fall asleep without disturbing your partner or having to wear ear buds. Take advantage of the small size and ample volume of these pillow speakers to experience comfortable private listening with your own comfortable pillow. Take advantage of the small size and avoid the issues that ear buds or large headphones can present. You can be comfortable and sleep in any position including sleeping on your side without the discomfort that other devices can cause. Read our testimonials and you'll be convinced that these small speakers are the best pillow speakers and great value. Use with standard or king size pillows. Just slip the low profile pillow speakers in your favorite pillow case and under your pillow and press play. Use with CD players, iPods, iPhones, iPads, most MP3 players and TVs. The pillow speakers 73" long cord means you don't have to worry about placing the device close and worry about straining to plug the pillow speakers in. You can use just about any audio device since most devices accept the 3.5 mm audio connector. In-line volume allows you to conveniently adjust the volume without having to reach for your audio device. Does not require batteries or power - simply plug the 3.5 mm audio connector into your device of choice and set the volume as desired. Learn about our amplified pillow speakers for additional volume by clicking here. Our amplified sleep speakers are perfect for use with white noise to get additional sound masking if your bedroom could use a little more sound isolation. 1/8" (3.5 mm) plug fits most electronic machines including Sound Oasis® Sound Therapy Machines, iPods/MP3 players, CD players, TVs, etc. Product dimension : 4.96" x 2.48" x 0.79"
Package dimensions : 6.46" x 1.22" x 4.02"
I've tried several different ones and this is perfect with the double speakers and volume control. Husband loves it and I can now sleep. Thank you. I've tried several different ones and this is perfect with the double speakers and volume control. Life-like quality! I use these with a Sound Oasis system and they work beautifully! The pillow I have is a special contour shape, and they fit perfectly underneath. I haven't tried them with an ordinary pillow. The sound is clear, natural, and I can easily adjust the volume. I just purchased 3 more sets along with sound systems for Christmas gifts for my office staff. I am so thankful to have discovered Sound Oasis on the Internet. I recently downloaded two files, one for Pink Noise and the other for Tinnitus. They each have an 8 hour, uninterrupted, playing-time and can be downloaded onto a MP3 Player. Once there, I can either use my earbuds or my Ipod dock to hear the downloads. The Pink Noise very effectively covers any and all extraneous sounds and the Tinnitus is very soothing to my ringing ears; both exceeded my hopes and expectations. Equally important is the excellent customer service, this is by far one of the greatest companies with products that actually do what they say they will do.